Perfectionism is an ideology. It’s what most of strive to be, but as much as we don’t want to admit it—all of us are going to fall short of this goal. So why, dare I ask, do you hold your characters to the high standard of this unachievable goal? Those reading a book realize that perfectionism is an ideology. When they see a character that is flawless and perfect, this character appears as two-dimensional. They’re not real. They’re not larger than life like we expect most fictional characters to be. First and foremost, a flaw is a trait that affects your character in some way. It could be a weakness that has serious consequences, such as lying and getting caught by a loved one or an employer as a direct result. Real people do this and so should your characters. This is going to add conflict and action to your story. If your character has everything they need, their life is perfect and they don’t have a hair out of place—well then, where is your story? The reader is going to put down your book and may not pick it up again. Give your character flaws that send them down a rabbit hole. Get them into trouble and move them toward the climax. In order to create rich character flaws, think of those flaws of your loved ones. Your cousin may spend too money, while your best friend may smoke like a chimney. These flaws show weakness. In the case of the cousin, it shows insecurity. With the best friend, the weakness may be nervousness, grief or loneliness. But these flaws are going to stand out to your reader. They’re going to relate better to your character because of them. They’re going to show your reader that, in fact, the character is not perfect. Rather, the character has struggled just as the reader does. At the same time, you don’t want to give your character too many flaws. If they smoke like a chimney, for instance, don’t make them anxiously bite their nails or drum their fingers on the table. This shows impatience and insecurity. Give them a strength that seems reasonable. While they may smoke like a chimney, maybe they give charitable donations or help those misfortunate within their community. In other words, make sure there’s a silver lining in the cloud. You also have to understand the character’s backstory. Why did your character start smoking like a chimney? What made them first anxiously drum their fingers on the table or bite their nails? Negative traits aren’t formed out of boredom but out of habit. What experience(s) shaped these flaws for the character? Too much backstory is going to throw your story off and your reader will lose interest, but sprinkling it in through dialogue and action is the way to go. Give your reader hints of why your character acts a specific way and they will continue reading until the last word. Finally, your character’s flaws are going to help the story move forward. Remember that nobody is perfect. It’s okay for your character to make mistakes. Your reader will emphasize with your hero because they (your reader) has also made mistakes throughout their life. In turn, this is going to make your readers root for your hero’s success. Throughout the novel your reader has connected with the hero; the hero is just like them. But, what if the hero was perfect…they never made a mistake? Your story will flatline and so will the interest of your readers. So embrace your flaws. None of us are perfect and neither are your characters. Make them jump off the page and into your reader’s imagination. Make your hero seem larger than life. Your story is going to read better for it and your readers will be anxiously awaiting your next book. I could not agree more. 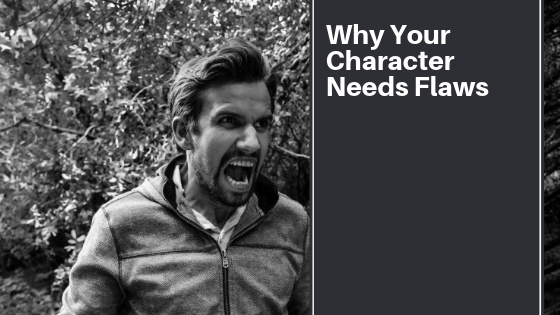 Flaws make characters three-dimensional and often more loveable. I think the reader can relate and grow closer to flawed characters because, as we all know, we have faults too.